I love Christmas. Most kids do.. Whether or not Santa and the elves are involved, it’s a magical time. There’s often snow here in Pennsylvania. We see family we don’t often. We dress up in rich colors and gather in cozy houses with warm drinks. It’s a time we splurge, in many ways, in the name of the holiday. But there are a lot of people who have a lot of reasons not to be cheerful during Christmas. “Chestnuts Roasting On an Open Fire” sets our sights high, but what if we don’t have a fireplace or even know where to get chestnuts? We can get hung up on little things that “ruin” the big day, but what if this year has to be celebrated without a cherished friend or family member? What if there isn’t money for carol-worthy festivities? Or what if the world just seems like a dark and bitter place compared to what we’re supposed to be experiencing? I grew up with a particularly enchanting childhood, and Christmas was the epitome of it. My parents love Christmas, and always went (and still go) to great lengths to make it wonderful for everyone. Last year, however, just before the Advent season began, I was brought face-to-face with a grievous sin that had been here in the world all along, and I didn’t know it. Instead of the world I’d come to believe was real, a very different reality presented itself and argued to take its place. Instead of the aforementioned, traditional bliss of the season, I got to realize more of the reality that lots and lots of people know firsthand. My response – cling even tighter to Advent, the season of waiting. Not waiting for Christmas morning and Christmas dinner and Christmas presents. Waiting for the baby. Looking at the world through the eyes of Jewish shepherds and a young expectant girl, told that the Messiah foretold 700 years earlier in the book of Isaiah, the descendant promised to Abraham hundreds of years before that, was finally coming. And he would change everything. It took me a long time after becoming a Christian to see the Bible as one story. I thought the Old Testament was about God, the New Testament about Jesus. Actually, the whole thing is about all three persons of God. Jesus is written into everything in the Old Testament – he’s foreshadowed in the system of sacrifices and being clean or unclean, he’s the fulfillment of all the promises, he’s the keeper of the covenants. And once Jesus gets here, every word out of his mouth is about God and the Spirit. So all the promises God made throughout Jewish history, all of them suddenly come true when God is born. My son was about 10 weeks old when I started studying Advent last year. I knew helpless babe. I knew the grittiness of birth. And I knew expectancy. Knowing it’ll happen one day… soon… and just waiting… My husband and I tried to be constantly well-rested, just in case I’d go into labor at 1 AM, and then we could say, “Good thing we went to bed at 8!” (As it happened, we went to bed uncharacteristically late the night he was born. Thanks, “Dr. Who.”) Now, we’re waiting again for Jesus to come back and finish the work he started. He defeated evil. We’re living in this funny middle time where we know evil and death have been defeated, but we’re still here among it. We’re still fighting, but fighting from victory. We know how it ends. We just have to wait until Jesus finishes his work. And that’s what people mean when they say Jesus gives them peace and joy. That’s how I could still celebrate Christmas last year, and every day since then. I know how it all ends. Jesus wins, and along with him, everyone on his side. We shouldn’t be shocked when we see evil and its effects – anyone who’s honest with themselves recognizes it in themselves – it’s what we get for being born human. But once that New Earth is here, we get new, perfect bodies, free of anything dark or bitter. For now, we live in the paradox of a created, beautiful world that is marred by sin and evil, knowing that it has been defeated but waiting to see that truth. And in the midst of it, knowing we belong to the victor, the tiny baby of Christmas. Download and print these Advent Verses to read during the countdown. They are largely from the Old Testament and include a wide variety of books, with an emphasis in Isaiah. 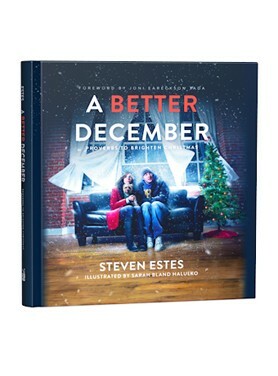 Some thoughts borrowed from Steven Estes in “A Better December.” For more on audacious joy, see Ann Voskamp’s blog, “A Holy Experience“. Ann’s sister was crushed by a truck in front of her when she was little, her mother went to a psychiatric ward, and she has since buried two nephews. She is the author of the book, “One Thousand Gifts“.